I know from personal experience that burglars and vandals have a field day when they come across an exterior door unprotected by a deadbolt. Even a door equipped with a quality lockset is an easy target since the latch usually doesn’t extend far enough into the door frame and the strike plate isn’t reinforced to withstand a sharp kick. A well placed boot will tear the strike plate loose and splinter the jamb, providing easy access to a house. Installing a deadbolt, in addition to the lockset you already have, adds an extra layer of protection to help solve the problem. Avoid cheap, bargain locks when buying a deadbolt lock. There might not appear to be much difference between a $10 deadbolt and a $30 model, but there are. Stick with a name brand, such as Baldwin, Kwikset, or Schlage. If you’re willing to spend a little extra, you’ll get a deadbolt that’s three times as strong as the economy model. Whichever brand you choose, look for a hardened-steel bolt that extends at least an inch into the doorjamb. A lock with a thumb latch on the inside makes easy pickings on doors that have glass panes or sidelights, since a burglar can simply break the glass and unlock the door. A deadbolt with a key on the inside is a more secure option, but it also can make it harder to open the door in an emergency. That is a real concern in case of fire, especially if you have young children. In these cases, it’s a good idea to keep a key near the door but out of sight and reach of someone on the outside, and to keep the inside key in the lock when you’re home and remove it when you’re away. Some building codes require that at least one entry have a thumb-turn latch on the inside, so check your local codes before deciding on which type to install. Even a quality deadbolt is only as good as the weakest link in the chain, and that’s usually the door jamb. Some manufacturers reinforce the bolt with a steel pocket that’s mounted in the jamb behind the strike plate, but I like to go one step further. 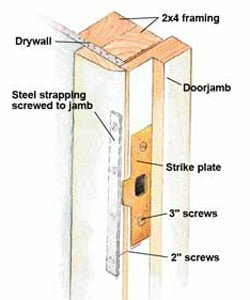 When installing a deadbolt, I take off the door casing and add an extra piece of steel strapping to make sure the bolt won’t blow out the back of the jamb if it’s kicked. We and install the strapping on the inside edge of the jamb, right behind the strike plate. Use 2″ screws, and rout a small hollow in the back of the casing to accommodate the strapping. I use flat stock, available at hardware stores and home centers, that’s 3/4″ wide by 1/8″ thick and 6″ to 8″ long for the strapping. Another important way to reinforce the door frame is to use 3″ long screws when installing the deadbolt strike plate. These are long enough to penetrate the stud an inch. While the door casing is off, fill the void between the framing and the jamb with solid material before screwing on the strike plate. If you take the time to do these extra steps when installing your deadbolt, you’ll have strong, secure door that will frustrate potential burglars. Thank you for the help. 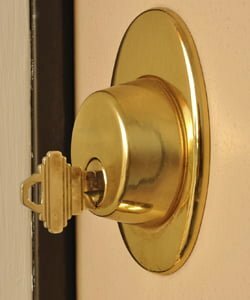 I just moved into a new house and have decided to install new deadbolt locks. I had not realized that you can reinforce the strike plate. How strong are they if you don’t reinforce it at all? Get rid of dogs – simple!! deadbolt of back door (wood) to let dogs out 50x a day locked me in house last night….cannot un-bolt it with the turn mechanism….got drill…un-did the two screws…they fell outside and inside…took off the brass circular thing…but the INSIDE -in-the-round-circle-mechanisms are STILL locked and I can’t figure out what tool to use to get that out, to un-lock the door. Help! must use front door, put 2 dogs on leashes, open side chain-link fence-gate, let dogs off leashes, go back in front door of home. HELP!